Stayed at home the whole of yesterday as we have been going out everyday from last last Saturday (Chinese New year eve) until last Saturday (7th day of Chinese New Year). So yesterday, Sunday, was the last day of the Chinese New Year holidays, also the day before work starts as usual and working life back to normal again, we just stayed at home as we did not have any mood to go anywhere. 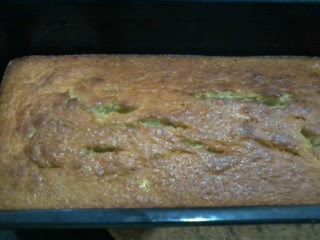 In the morning, I have decided to bake a banana cake as I was craving for banana cake for the past week. The ones bought outside usually are very sweet, and full of banana essence on first bite. But I was very disappointed as the cake failed on my first attempt! I think it was too heavy, thus, cannot rise nicely. It looked perfect in the outside, but the texture inside looked like steamed cakes. Nevertheless, hubby supported the cake and finished half of it. He kept saying it was delicious. The remaining half, I brought it to work today for breakfast. Ingredients: 1 cup self-rising flour, 3/4 cup sugar, 1/2 bar butter, vanilla essence, 2 tbsp milk, 2 eggs and 3 mashed pisang emas (in future, I will just reduce to 1 banana). Had lunch around 12pm, and then afternoon nap with Kenzie around 1.30pm. At 4pm, I wokeup and got ready to cook. Since we have decided to stay home on Sunday, I had already thought of what to cook for dinner on Saturday. 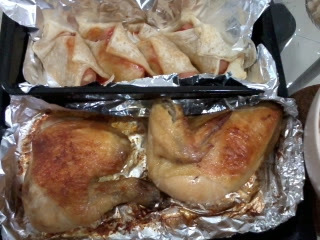 What I had in mind: Roast chicken and tuna maceroni. So I marinated the chicken on Saturday night - with salt, pepper and beer. I got this beer idea from hub's boss on Saturday morning when we visited him in his house. We were chatting about food and suddenly, he was talking about roast chicken with beer. So for a change, I tried it since we have enough cans of beer sitting in the fridge. Anyway, I already took out the chicken from the fridge to sit at room temperature at about 2pm. So by 4pm, it was already at room temperature. I baked the chicken at 200 degrees with some butter. After about 40 minutes, I threw in some cheese-sausage puffs as well. While the chicken was baking halfway, I thawed 4 slices of frozen pastry, dabbed tomato sauce on each of them, rolled half a cheese-sausage into each slice of pastry together with some onions and baked them together with the chicken for about another 20 minutes. While the chicken and sausage puffs were baking in the oven, I worked on my maceroni. It was a simple dish, with minimum ingredients. 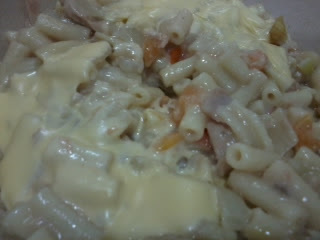 I only used: 1 tomato, 2 medium-sized onions, 1 can tuna, 1 can of Campbell cream of mushroom and 2 slices of cheddar cheese (as topping, optional though). My style: Boil maceroni in a pot. In another wok, fry onions and tomatoes in olive oil. Then, throw in the can of tuna. Once the maceroni is soft, scoop the maceroni into the wok and mix in the can of cream of mushroom (no water needed) as I wanted the gravy to be thick and creamy. Stir until everything is mixed, top with cheese and serve (no baking needed). We enjoyed our dinner very much and hubs kept saying everything was very delicious. The chicken was fantastic, with its crispy skin and buttery gravy. After dinner and doing the dishes, I was thinking of a refreshing dessert. 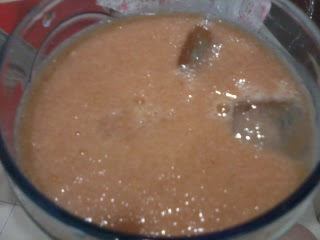 A fruit shake perhaps? 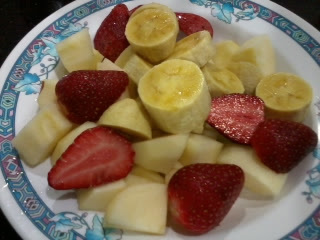 Made with apples, strawberries and bananas. Just cut everything into pieces, blend with cold water and add a wee bit of sugar. Serve with ice cubes. Kenzie enjoyed every sip, too.